Growth in material living standards, which is just one measure of overall (average) prosperity and contestable at that, depends on productivity growth. How national income is distributed, real wages growth in relation to productivity growth, and the employment rates also impact on how this average is reflected in the fortunes of individuals. Strong productivity growth is only a necessary condition for improved material living standards. In this period of fiscal austerity with suppressed overall growth rates and labour market deregulation that undermines working conditions and reduces the incentives to invest in best-practice technology labour productivity is falling – as will living standards in the coming years. The world is locked into an idiotic race-to-the-bottom. It is a curious period really. The hypocrisy of governments, aided and abetted by the right-wing think tanks, who claim they are cutting into public spending to reduce the drain on living standards of our children and grandchildren, is clear to see. What they are really doing is undermining the future prosperity of the next several generations at the same time that they push millions into unemployment and poverty now. Why are we so stupid that we tolerate this nonsense? Mainstream economists can even justify public spending on R&D using the ‘market failure’ argument. Accordingly, there would be insufficient resources allocated to R&D if it was left to private sector decisions (‘the market’). Why is that? The inventor always has a difficulty capturing the benefits of major discoveries. This becomes more so when there are low-cost methods available to reproduce the technology. This is especially true for so-called ‘pure’ or ‘basic’ research which often is hit-and-miss but when it hits usually provides valuable knowledge which drives innovation and technological change. In situations like this, the private market will under-invest even though the social returns (the benefits that accrue to society in general) might be considerable. This situation describes an example of ‘market failure’ and provides the justification for public funding. The mainstream argument was well expressed on May 16, 2011, is a speech the then Chairman of the US Federal Reserve Bank gave in Washington – Promoting Research and Development: The Government’s Role. A growth rate of output per person of 2-1/2 percent per year doubles average living standards in 28 years–about one generation–whereas output per person growing at what seems a modestly slower rate of 1-1/2 percent a year leads to a doubling in average living standards in about 47 years–roughly two generations. The same calculations show that if productivity growth (per capita) is only 1 per cent per annum, then it takes 70 years to double average GDP per capita. The performance of most nations (and blocs like the Eurozone) since the GFC has hardly been inspiring in this regard. The following graph (using the AMECO annual database) shows the average annual labour productivity growth between 1995-2008 (blue bars) and 2008-2014 (red triangles) for a range of nations (including the US, UK, Australia, Japan, New Zealand, Norway, Sweden, Canada and the European Union nations). The data is ranked large to small for the 2008-14 period. I could use even earlier data which would show that in the period of full employment labour productivity was much higher as governments maintained sufficient spending and provided healthy funding to spawn major technological innovations. The current policy settings in place for nations such as Greece are clearly not only undermining current material prosperity but the impact on labour productivity for future growth in GDP per capita will be disastrous. The policy elites are impoverishing several generations of Greece citizens. 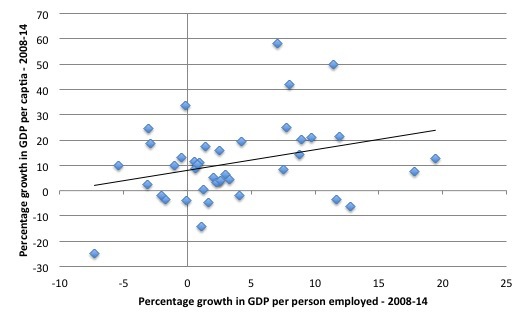 The next graph (using the AMECO annual database) shows the percentage change in GDP per person employed between 2008 and 2014 and the percentage growth in GDP per capita over the same period for the same nations as above. The relationship is clearly positive – nations with stronger productivity growth enjoy higher growth in GDP per capita (material living standards). Greece is a sad story – deliberately invoked by the policy elites in Europe. On Monday October 19, 2015, the OECD released its – Science, Technology and Industry Scoreboard 2015 – which is a set of indicators that shows how nations are doing with respect to investment and innovation in science and technology. The data is quite disturbing. Remember the OECD is one of the international organisations that were berating nations about their fiscal deficits and demanding so-called structural reforms (making labour cheaper, more casual and less protected). So, like the IMF, they are now trying to regain some credibility given their major errors of judgement during the crisis (and before). They are generally not doing a very good job in that regard. But their warnings about R&D expenditure is at least something sensible. Korea, in particular, has made great strides in these fields recently. While Korea’s public R&D spending has quadrupled in real terms since 2000, reaching 1.2% of GDP in 2014, public R&D spending in many advanced economies has stagnated or experienced significant fluctuations, averaging less than 0.7% of GDP in 2014 in the OECD area. So Korea is doing it again! Its development plan out of poverty in the 1970s was driven by a strong state involvement in funding, planning and regulation. Nothing happened in Korea without a strong and large guiding hand of the national government. Public funding has underpinned many of the technologies driving growth today, from the digital economy to genomics. We must continue to lay the technological foundations for new inventions and solutions to global challenges like climate change and ageing and must not let investment in long-term research wane. We learn that “since 2010 R&D funded or performed by governments in many advanced economies has declined or flattened … [and] … Cuts to R&D spending threaten to destabilise science and research systems in many advanced economies”. Figure 1 from the – OECD Science and Research Briefing Notes – reproduced next shows the trends in Government R&D spending since 1999 (indexed at 1999=100). Korea is demonstrating what the rest of the world is ignoring. … may have a deleterious impact on the performance of the science system by creating adjustment problems and discouraging long-term planning. Severe adjustments can have a particularly marked impact among younger and non-tenured research personnel, especially if there is limited absorptive capacity in the private sector. Research activities subject to merit-based competitive funding can bear a disproportionate share of cuts when there are rigidities in public research systems, which can then compromise scientific excellence. We are feeling these squeezes in Australia as the austerity mentality of recent governments has hacked into public funding of research. When the previous Labour government (2007-13) became spooked by the conservative media and became obsessed with getting the fiscal balance back into surplus as soon as possible (it was an impossible task given the circumstances) it cut funding to R&D. The current government restored some of the losses but 2015 is not looking good as they talk ‘tough’ about the alleged (non)-need to cut the deficit. I have run a small research team for nearly 20 years now and it has relied on my capacity to generate research funding. A large proportion of the funding I receive comes from various competitive schemes funded by the Federal government. These schemes are cut-throat (low success rates) and not very well funded overall. It is a fraught existence backing your track record to keep funding coming in while trying to maintain a critical staff mass on short-term contracts. 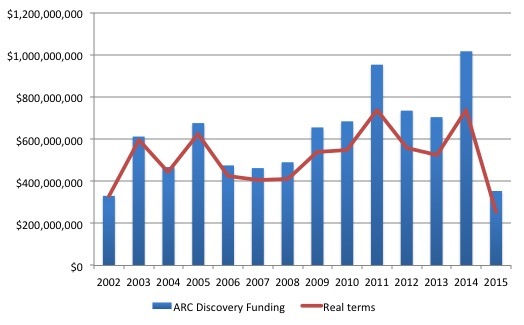 The following graph shows Australian Research Council (one of the major schemes) funding since 2002 in $A. The 2015 funding round is not quite complete yet. With the overall squeeze on funding in recent years and more people trying to get it (to make up for shortfalls in other funding schemes), it is getting more and more difficult. The future will be compromised as a result. There was an interesting World Bank Policy Research Working Paper published in 2011 – The Impact of Government Support on Firm R&D Investments: A Meta-Analysis. It noted that the “promotion of research and development (R&D) and innovation is a standard component of ‘stimulus packages’ adopted by advanced economies to counterbalance the effects of the recent global crisis”. They note that “government budget appropriations or outlays for research and development (GBAORD) increased 46 percent in the Slovak Republic, 33 percent in Korea and 20 percent in Germany in the period 2007-11”. But, many nations significantly cut public spending on R&D as part of their austerity response. The World Bank meta study considers the findings of 37 major studies to “identify patterns among the study results”. 1. “The effect of public investment on research and development high heterogeneity of precision is explained by the wide is predominantly positive and significant”. 2. “public funds do not crowd out but incentivize firms to revert funds into R&D”. There are many studies that support these findings. The work of Mariana Mazzucato is also indicative. In her excellent book The Entrepreneurial State: debunking private vs. public sector myths – she demonstrates clearly that governments “drive the big missions of the future”. … all the technologies that make the iPhone so smart were indeed pioneered by a well-funded US government: the internet, GPS, touch-screen display, and even the latest Siri voice-activated personal assistant. There are countless examples of this. Ensuring there is strong growth in public R&D spending is one path to the future prosperity of the coming generations (‘the grandchildren’). Cutting such spending and undermining the leverage that the private sector gains from strong knowledge accumulation being driven by the public sector is a sure way to undermine the future prosperity of the coming generations. The fiscal austerity mindset is a very myopic syndrome. The problem is that the damage to future prosperity is being done now and it won’t be until later that it becomes really apparent. Your posts are always thoughtful and useful. I keep telling people in Spain that South Korea is the model we should follow. We have about the same population but they have much lower unemployment and much higher growth of GDP and productivity. Just 3 or 4 years their GDP per capita overtook ours. I have been a witness, nay, a victim of the impressive growth in R&D spending in Spain followed by its collapse in the wake of the austerity program imposed by the ECB, the EC and their local cronies, the conservative government led by that luckluster politician Mariano Rajoy. The consequences for scientists and technology startups has been appalling. Stuart, a Spanish academic I once knew some years ago before the GFC told me that although university academics didn’t make much money, they weren’t bothered by admin nor where they told what to teach. In general, this was felt to be a decent trade-off. I do not know what is happening in Spain in this regard (I would be interested), but what is taking place in the UK is that universities see themselves as businesses and everyone is overworked. University admin staff before Thatcher saw themselves as there to help the teaching staff. Well, that idea went the way of the Dodo. And, although those who brought in funding were always considered valuable members of staff, they are now considered essential, so much so that teaching is sometimes execrable except in those disciplines that see themselves under threat of annihilation. This paradigm has even affected the kind of software that universities feel they can afford to buy in as well and that companies feel they can afford to discount to universities. Hence, for example, the many courses set up online that teach the rudiments of R, an open source statistical software program. The only problem with it from a student perspective is that it doesn’t have a very good GUI. It is a dire situation that has been in play some 30 or more years. Agree about Mazzucato. But it isn’t only the iPhone. The very idea of a computer’s graphical user interface was initially funded by government grants. The reason that Windows doesn’t have as good a GUI as Apple is that IBM considered graphical interfaces as improper for business, and IBM was Microsoft’s first client. Consider how long it has taken Microsoft to (almost) catch up with Apple in this respect. Though fundamental, it is only one aspect of the computing interface structure. Comparing this with the hoped for demise of the neoliberal paradigm almost doesn’t bear thinking about. A Spainard who wants to become a Korean automan. This characteristic of looking outward rather then inward is especially common in Catholic countries exposed to 20th century modernism / capitalism. Pure research is vital to future prosperity. We lose much when funding for such research is doled out to the private sector which is better suited to product development which builds upon new knowledge developed by the public sector were there is greater cross pollination of ideas and profit isn’t the sole motive for the research. Just as nature doesn’t know how a species will have to evolve to survive future pressures, we don’t necessarily know which ideas evolving today will become important in the future. Like nature we need already built in diversity to give us a swiss army knifes worth of tools to adapt to and survive whatever conditions the future brings. This is what universities used to give us. I remember in the 1980’s how researchers from abroad routinely visited some Canadian university research labs to gain new insights that proved useful, yielding profitable new inventions and new ways to achieve productivity gains. Canadian corporations did not seem as well positioned to take as much advantage of the available knowledge sitting right at their own doorstep. When it came to corporations getting funding for product development there was so much administrative overhead involved in meeting the government reporting requirements that nearly a dollar was needed to administer a dollars worth of funding. That was if you could get funding in the first place. Today it seems that public university and college administrators are preparing for future privatization themselves under the neo liberal grand plan. Economics departments teach the models that squeeze the funding for public institutions hardest for funding, driving the process. Private donations have become ever more important and much research especially in medicine and pharmaceuticals can only be done if a private sector partner can be found. Top level administrators in other public institutions such as hospitals have already taken advantage of the now fully developed frameworks for public-private partnerships to situate themselves as administrators within the same public institutions that are customers of service providers organized as private corporations on which the very same administrators serve on the board of directors. Previously installed law prohibits the release of sufficient information to identify all of the players directly. This sort of arrangement is probably coming to public universities and colleges if not already here. As employers, universities and colleges had been important contributers to the local economies in which they were situated. This is rapidly changing. Today these institutions lead the way in developing ever more aggressive tactics including outsourcing of formerly union jobs, for suppressing worker wages and benefits. Public institutions which had once afforded the opportunity to the otherwise working poor, the decent wages and benefits needed to raise healthy well educated offspring are no more. Won’t some of this change now that Trudeau fils has been elected premier? Or is what we have seen all hype? Research today is used to increase yields on human assets. Problem is this value added syndrome typically subtracts value. When you consider that humans should have a equity stake in the commons rather then act as a conduit for the corporate sector this pointless endeavour becomes more clear. Spaniards should learn from the previous Muslim colonisers. To enrich the land rather then subtract. Spanish highlands are some of the richest places on Earth. They should return to the village setting on a permanent basis and not those hideous ski stations at the weekends. Larry, I certainly hope it isn’t all hype. Nearly the entire country seems to have put their faith in Justin and the Liberals. What have we actually seen though? If the Liberals continue the neo-liberal program they have helped to set in motion in the past it will be seen as a betrayal of the sort that the public might never forget. There seems to be a pattern of Conservatives and Liberals offering appeasements to different groups on social issues while pursuing largely common interests in free market fundamentalism and in facilitating trade agreements which favor a globalism were national economies are dominated by transnational corporations. As long as one or the other party are in power neo liberalism has continued to advance unimpeded. There hasn’t been a signal other than promises of three years of small deficits to support any belief that much will change. Down at the provincial and municipal levels the austerity is being felt severely with spending cuts and privatizations of public assets underway even in provinces were Liberals are in power. In Ontario the electrical power infrastructure was about to be sold off by a Liberal government; I have not heard anything about a reversal or putting that decision on hold since Liberals gained power at the federal level, which is a little concerning. Am I the only one who feels like it’s going to be too hard to break the Neo-liberal narrative from the outside? I’m starting to think it has to destroy itself so it can be torn down. Unfortunately with climate change this may mean the end of most if humanity in the process. I’m starting to get more and more disillusioned by the day. I feel like I’m trapped in a bizaare inverse world of atlas shrugged where the progressives go on strike to let the elite destroy themselves. Is it the only way to solve this mess? Like Bernie Sanders keeps repeating. He says it’s going to take millions of people to get behind him to implement change cause he can’t do it alone. Hopefully Australians who have had it so good for so long may catch some of that energy. I guess people have to start to really hurt before they realise they need change. Sadly part of me wants to escape to a tropical island and let Rome burn so it can be rebuilt. I’ll try to keep my head up and be inspired by your passion and energy Bill because I need all I can get. Maybe it’s the whole day I spent on 5 years of tax returns that has left me jaded. Oh I wish we could simplify tax so all those accountants could do something we really need done rather than shuffle figures and loopholes. Oh well Tomorrow is a new day! First of all, thanks for writing your blog, it really is a very insightful body of work! And I enjoy reading it. Are there any other measures which would better serve to show us how our general quality of life is improving? Something that would take into account how people live, rather than just what people have in their pocket. I find it a bit amusing when austerity types,brush off any criticism of markets and capitalism by holding up the iPhone as an icon of the brilliance of free markets. Sure private firms did a good job in adapting technology for the consumer markets. Mazzucato’s work is very important.lIndicative of the types of role states and government s have in supporting the advancement of of technology which can raise living standards and increase productivity-through consistent heavy public R&D investment. The EU should redirect its entire common agricultal policy budget toward a continent wide R&D program in all sorts of scientific fields,including life’s sciences health/nanotech,to keep Europe’s ageing population fit and and able to work be productive over the coming century. I also think relying on externality taxes on pollutive activities, won’t be enough.It expect the free market to develop and innovate the technology and infrastructure for low cost energy consumption which is clean,not to mention the real challenge of finding a cheaper alternative to petroleum products. Instead the government (any of them) should have a Manhattan project style focus and vast scale of investment in develop the tech and infrastructure which provides the private market with a cheaper option.Which is the purpose of the public sector,too lower the cost of doing business and living.